The Cap Cupboard, an on-campus food pantry for students, has officially opened its doors to the university. Monday, Oct. 22., the Cap Cupboard officially launched as Capital’s latest student resource. The pantry is the product of the combined efforts of several campus offices including the Office of Student and Community Engagement, Student Success, the Office of the Dean of Students, and Campus Ministries. The Cap Cupboard was created to provide students in need easy access to free food. Deanna Wagner, the dean of engagement and success, said the opening was a successful event. “We’ve had over [the] course of the last two weeks 28 visits to the Cap Cupboard,” said Wagner. This strong start can be credited to several donations received prior to the pantry’s opening, and a steady stream of volunteers. Wagner also said that the Cap Cupboard has evaded exploitation from students looking to take more food than needed. “We’re keeping track of what folks take, just so we can adjust our inventory every week, and students seem to be taking what they need, and not taking to excess. We’ve seen students come in for just a couple small items … and then we’ve seen other folks come in who’ve taken more like ‘I need a substantive meal that would last me throughout the week kind of a thing,’” Wagner said. 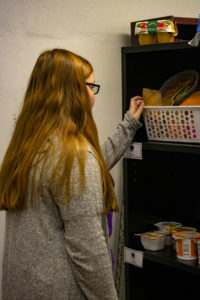 The pantry is almost fully staffed by student volunteers who help out by stocking the Cap Cupboard and by explaining how the pantry works to newcomers. First year Food Pantry worker, Victoria Wymond, restocks and readjusts the shelves of food now available for students. Brooklyn Sizemore, a first-year biology pre-medicine major, began volunteering for the pantry through Capital’s Embrace Ministries. Sizemore said her job involves filling shelves, greeting visitors, and making sure that people know how the pantry works. Visitors to the pantry are allotted ten points per visit. Sizemore said she thinks the pantry’s system is a good one, and that she is happy that those in need are able to use this resource. Bonnie Grimaldi, a sophomore studying for her Master of Divinity at Trinity Lutheran Seminary, is one of those who heard about the inauguration of the student food pantry and wanted to help. “We wanted to do a Thanksgiving food drive, and it was brought to my attention that there was one here,” said Grimaldi. Grimaldi is in charge of throwing the annual Thanksgiving Day party hosted at the seminary for the Trinity community. This year, a competition will be held during the event to see who can bring in the most donations for the Cap Cupboard from one of the three Integrative Groups that all seminary students belong to. “There was someone in our group who brought it up, that it was in operation. That was really exciting to us because we wanted to help the other students here at Capital,” said Grimaldi. “We want to help those in need in the Cap community according to what we as Christ followers are called to do,” Grimaldi later said in a email. The Cap Cupboard is open Monday through Friday from 11 a.m. to 1 p.m. and 4- 6 p.m. If a student cannot make any of these times or feels uncomfortable with just walking in, please contact the pantry at capcupboard@capital.edu to schedule other arrangements.